Hey y’all – today I’ve got a boy (or girl. Or baby, woman, man or kid) pattern for you – except this time it’s a knitting pattern, not a sewing pattern. I hope you don’t mind the switch up from sewing! 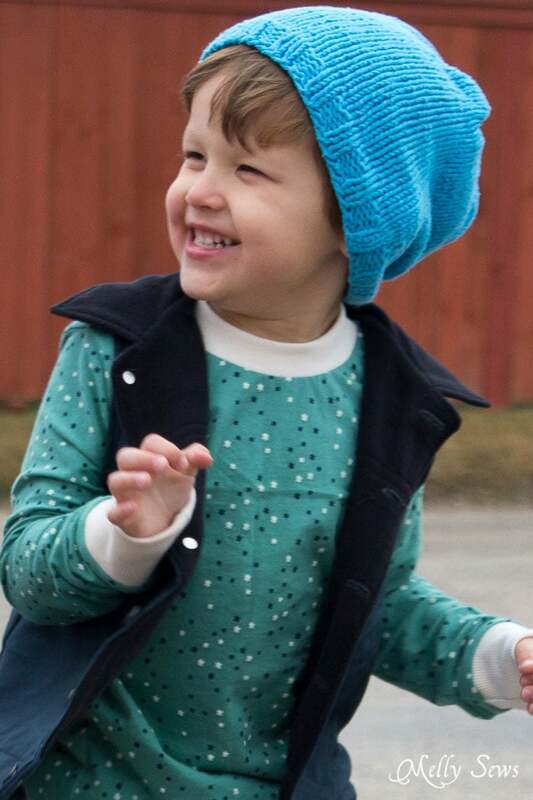 This is slouchy knit beanie pattern that’s not a beginner pattern (because you have to knit in the round) but if you’re not afraid of a few knitting needles it’s an easy and quick project. 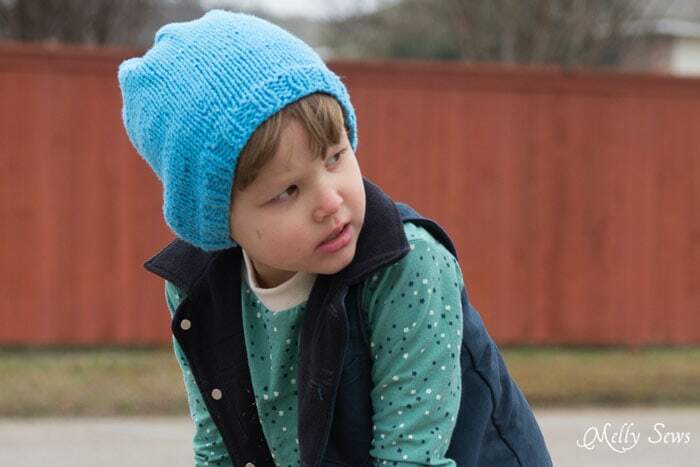 The great thing about this hat is that is can be made in any size with any kind of yarn. Yarn. This is going to depend on your gauge again, but generally 1 skein will usually be enough, though if it’s a very small skein or you’re knitting the largest size you might want 2 skeins to be safe. CHECK YOUR GAUGE! Cast on stitches and knit for a 4″x 4″ gauge swatch in stockinette stitch as specified on your yarn label to make sure your gauge is the same as the one specified on your yarn. If it’s not, that’s OK, just figure out how many stitches per inch you are actually knitting (divide the number of stitches by the width of your swatch). Cast on the number of stitches in the chart below for the size you are making based on the gauge you figured out. Not sure about casting on in the round? See this post. Knit in a K2, P2 rib knit for 1 inch. 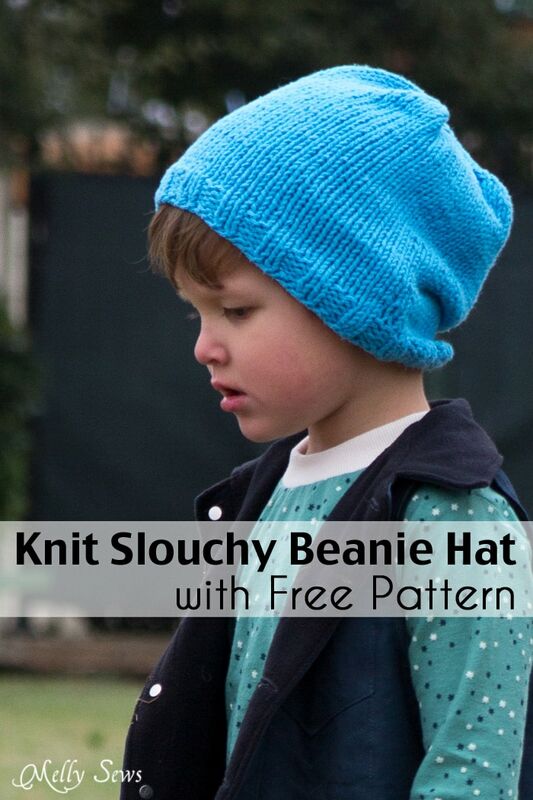 Switch to stockinette stitch and knit all stitches until the hat measures the length shown in the chart above. At the beginning of the next round, K2tog all stitches. Continue to K2tog all stitches until you have either 8 or 6 stitches left. Cut the yarn, leaving a long tail. Thread tail through the sewing needle and thread through each remaining stitch as you drop it off the needle. Pull tail tight to close up hat. And that’s it! I think I knitted Bean’s hat in the span of one football game using a 4 stitches per inch yarn. Oh – thank you for posting this pattern! Ever since I’ve seen the picture previously, I thought, I would love to knit that hat! And – now everyone can!! Happy Dance! Have a good day.